More than 9 million Catholics immigrated to the United States in the first decades of the 20th century, many to the area in and around New York City. One of these was Father Michael Lopez, who arrived in Astoria in 1924 to serve the people there. At first his flock of 24 parishioners met for mass in the home of Dr. John J. Dempsey, but within weeks they had grown to over 600, and needed a bigger and more permanent place to meet. The first organizational meeting to discuss the building of a proper church was held on February 6, 1924. A 50’ by 325’ plot of land was purchased on Ditmars Avenue and Lawrence Street (now Twenty-Ninth) and a tent was pitched to accommodate the growing congregation. Fund-raising efforts began immediately, and only seven months after Father Lopez said the first Mass, the cornerstone was laid for the Immaculate Conception Church-School on July 26, 1924. In 1933, Father Lopez was transferred and Bishop Molloy appointed the Reverend Edward Higgins as the new Pastor. Rev. Higgins served as Lieutenant Chaplain during World War I with the 152 Depot Brigade and General Hospital 13. While in the Army Father Higgins found that a large percentage of the people serving were Catholics, but that they had very little voice in the matters that concerned their faith, their country, and their home. It was to give these people a voice that Father Higgins founded the Catholic War Veterans. 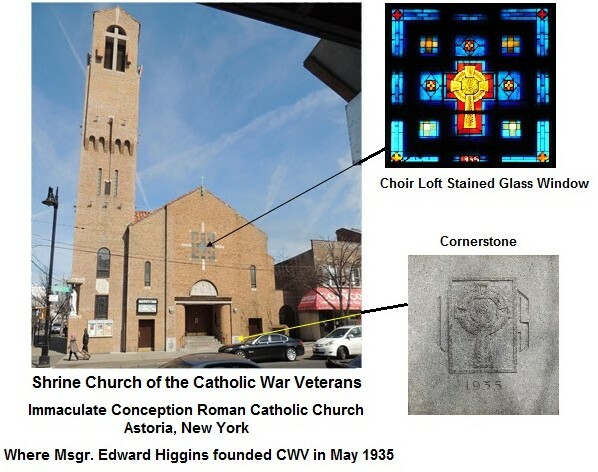 With the permission of his Bishop Ordinary and the state of New York, Father Higgins gathered together the World War I veterans from within his Immaculate Conception Church and formed the Catholic War Veterans. The announcement of the founding was made at the eleventh annual communion breakfast of the Holy Name Society, on May 12, 1935, with the forming of Astoria Post #1. On May 19th of that same year the organization was incorporated under the laws of State of New York, a date that has been celebrated as Founder’s Day ever since. The next month, June 1935, Father Higgins traveled to Rome where he received an Apostolic Blessing for the new organization from Pope Pius XI. The pontiff also blessed an American and Papal flag for the organization and presented Father Higgins with a photograph of himself, specially autographed, as an inspiration to the membership. A rectory and convent were built in the 1930s and it became evident that a new, larger church building was also needed. A building fund was set up in 1939, and plans were drawn up. The advent of the Second World War put a halt to the project until the 1950s. The new Immaculate Conception Church was finally completed in early 1951, and dedicated as the National Shrine for the Catholic War Veterans on May 5, 1951. Prior to the dedication mass there was a breakfast and a parade. The Grand Marshals were New York State Commander John F. Coughlin, Queens County Commander Vincent J. Ferrari, and Queens County 1st Vice-Commander Thomas J. Moore. Marching music was provided by the Mitchel Field Band and the Immaculate Conception Fife and Drum Corps. The church was dedicated and blessed by the Most Rev. Thomas E. Molloy, S.T.D., Archbishop of the Brooklyn Diocese, assisted by Father Higgins. The sermon was preached by Rev. Edward Lodge Curran, president of the Catholic Truth Society and pastor of St. Joseph’s Church, Brooklyn. Other marchers included over 100 CWV and Auxiliary members, representing most of the 40 states where Posts existed. In the Gallery section, a photo of a group of men are ones who formed the original Post #1. Second from the right, in uniform, is John M. Dealy, the first National Commander. The building was designed by Henry J. McGill, one of the era’s leading church architects. There are two cornerstones, one on either side of the main entrance. The one to the left of the door as you approach is the 1950 date stone. To the right is the CWV stone (shown above). It depicts the original logo of the CWV. The church also includes a number of stained glass windows that refer to the Catholic War Veterans, the Auxiliary and a Nativity window with Father Higgins wording. Additional images can be seen in the gallery section below.